Home / STORE / Asas Tomtebods / Tomte / Nisse. / Alfred. 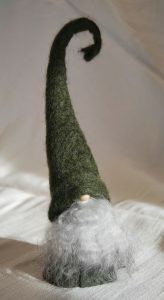 Alfred has a green felted, wool cap with a twist. He is dressed in green felt and has a genuine sheepskin beard. He stands approximately 25cm high.